After two gravies and some fritters in this No Onion No Garlic series, let us focus on the very essential part of a South Indian meal, a chutney. My sister shared this recipe with me a while back and I think she mentioned the usage of garlic. I had a sudden inspiration to make this chutney for the Ugadi thali and so skipped the garlic from the ingredients. I don't think we missed the garlic in this chutney. It was more or less like the Kandi Pachadi which we make. The above picture is of the Ugadi platter I made this year where moong dal chutney takes a spot. In a heated sauce pan, keeping the heat to medium, dry roast Moong Dal until it attains a golden brown hue and the aroma is pleasant. Keep stirring it and don't leave it unattended. Remove onto a plate allowing it to cool. Now dry roast red chillies separately and let them cool. Upon cooling, grind all the roasted ingredients adding tamarind extract, salt and enough water. We like the chutney in a coarse texture but that is individual preference. Note that this chutney will absorb a lot of water thereby increasing in volume. To prepare the seasoning, heat oil and add all the remaining ingredients. After the Dals brown and the mustard seeds pop, remove and mix it in the above chutney. Enjoy with steaming hot rice and a dollop of ghee as part of a satisfying meal! Wow, the entire ugadi plate looks awesome. The moong dal chutney is something new to me, it sounds delicious and healthy,Harini. Moong daal chutney sounds great..I never thought you could make lentil chutneys but when I made the Udupi Thali PJ suggested me a lentil chutnety. Your Ugadi Thali looks awesome and once again I am drooling over this elaborate festival spread. I love paruppu chutney a lot with steamed hot rice.. Looks so delicious, I just want to dig into them now, fantastic chutney harini !! Omg the Ugadi meals are mindblowing, am in aww you have so much patience to make this wonderful spread ... am just speechless ! !Kudos to you !! The ugadhi thali looks super delicious Harini! We prepare a similar chutney with toor dal minus the seasonings. Will try this version next time. That is such a wonderful thali Harini. We do make paruppu thogayal, but with toor dal. This version without garlic looks so good..
Definitely an interesting dal thogayal that too with my favourite dal. And this thogayal looks prefect to enjoy with anything. This chutney is very similar to kandi pachadi. I would love to try this one out some time soon. It looks easy enough to make and I love that it is protein packed and great as side dish to just about anything. 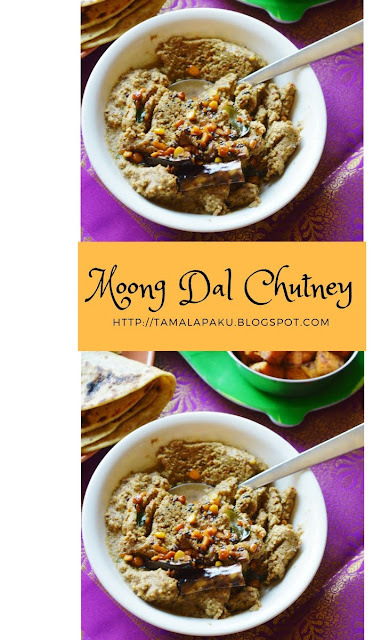 Healthy Chutney ,have never tried a chutney with moong dal this is a nice option!! Always used urad dal or toor dal chutney. Never tried moong dal. This is a great variation and bookmarked to try. We love such lentil chutneys, such a delicious dish with just plain rice right...your whole platter looks so inviting! Such a beautiful Ugadi Platter. Mouthwatering! I've not prepared a chutney using only dal. This one looks flavorful. Love your festival platter there, Harini. I really don't have he patience to cook that much on a festival day and I envy when you guys post these kind of delicious thalis. We prepare moong chutney in two ways. One is your version though we don't add coconut to it. Moong dal chutney looks so inviting and I am eyeing that amazing spread.Wonderful Harini. we make paruppu thogayal with toor & channa dal, without onion garlic and this seems to be on similar lines . Nice variation - I love this with hot steamed rice ..
Looks yumm Harini, hot steaming rice and chutney and ghee makes it divine! I have never tried moong dal chutney, I m sure going to try this !! What a spread this is! I can't take my eyes off the dishes. Love the moong dal chutney. A goos variety to try when we get bored of the routine. Moong dal chutney looks so interesting.. perfect with any snack.